Dog parks are a wonderful thing. For those of us who aren’t lucky enough to have a fenced-in yard, dog parks are a great way for your pup to get the exercise he needs without being confined to a leash. They’re also great for making sure that your dog stays socialized with other dogs. However, as a frequent visitor of my local dog park, I’ve learned that there are a there are rules that all dog owners should follow when they decide to take their pooch to get some exercise. Here are a few simple, common courtesy rules that my family and I have learned, and abide by, when visiting the park. Dog parks will often have water dishes for owners to fill up with water to ensure that their pet is staying hydrated while running around in the hot sun. It’s common courtesy to fill up a jug of water and bring it with you to the park. While your dog is off having fun, walk around to the water dishes in the park and make sure each of them is full of cold water for all of the dogs to enjoy. It may feel as though you don’t have to clean up after your dog when he’s at the park because it’s essentially public property, but it’s nice to follow the rules and do it anyway. Dog parks can get crowded, with both people and dogs, and no one wants to be stepping in a present left by your pup. Or worse, take their dog home, only to find out that he stepped in doo-doo at the park and now it’s all over the backseat of your car. 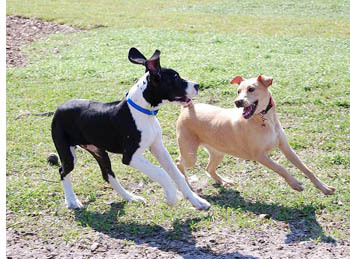 Yes, the dog park is your dog’s time to have fun and let loose with other furry friends, but that doesn’t mean you shouldn’t be watching him or her to make sure he’s behaving correctly. Dogs are easily excited by new environments, new people, and new dogs, which may cause them to be a little more aggressive, or get a little too rough without realizing it. Is the Dog Park the Right Fit for Your Dog? Every dog deserves to get out of the house and run free every now and then, but if your dog is antisocial, the dog park may not be the best place for him. If your dog is snarling and growling at the gate before he enters the dog park, you may want to consider taking him home and returning to the park when it’s less crowded. The last thing you want is another dog owner calling their injury lawyer because your dog bit them. If you follow these simple rules for dog park etiquette, you and your dog are guaranteed to have a great time at the dog park. Just remember to be considerate of the other owners and dogs using the park, keep a responsible eye on your dog, and make sure you consider your dog’s personality and whether or not the dog park would be a good fit for him or her. Last but not least, look up the rules of your local dog park and make sure you’re following their rules as well. Happy playing! Michelle Rebecca is an aspiring writer, blogger, and animal lover. She has a passion for the Internet, and loves how it connects people across the globe. She loves that blogging gives her the opportunity to voice her thoughts and share advice with an unlimited audience.